There are a variety of ways to work Plastimake into a thin sheet. This is the easiest way to get large, consistently flat sheets of Plastimake. Start by pouring a single layer of Plastimake pellets onto a clean metal or silicone baking tray. Gently shake the tray so that the pellets are evenly spaced. Bake in an oven at 70°C for approximately 20 minutes, or until the pellets flow into a single flat sheet. Once the Plastimake cools you will be able to pop it out of the baking tray. Plastimake won't stick to metal or silicone surfaces once it cools, but surprisingly it will stick to some brands of non-stick baking trays. This is a great technique for quickly making small, flat sheets. Start by forming a ball of Plastimake with your hands, then simply press it between two flat surfaces. 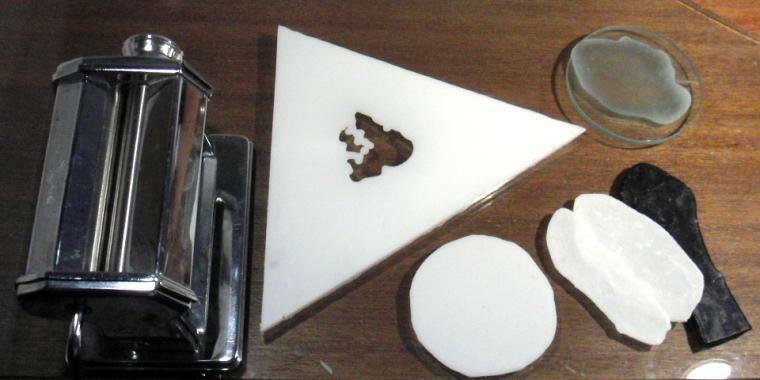 Dinner plates are often the right size for pressing out small sheets, just stack two plates with a warm blob of Plastimake in between them and press down. The thickness of your sheet will be determined by the height of the base of your plates. Roll out your Plastimake the same way you would roll out pastry. You'll need to work quickly before it cools. An empty wine bottle makes a great roller. Using a pasta maker you can create extremely thin sheets of Plastimake. Form a small, round ball of Plastimake and slowly feed it into your pasta maker. Try to avoid getting warm Plastimake tangled in the rolling mechanism of the pasta maker. If it does happen you might need to disassemble the pasta maker to get it all out!